Size matters. When you think back on classic, defining rock ‘n’ roll moments – from a Jimmy Page riff to a Kurt Cobain scream – virtually all of them are larger-than-life, impossible to ignore. That kind of scope is evident throughout “THE PLEASURE AND THE GREED,” the second Atlantic release from Boston’s Big Wreck-a band that’s clearly not hesitant to swing for the fences. Big Wreck won’t have to field any such accusations in the wake of “THE PLEASURE AND THE GREED.” Zig-zagging from the grab-you-by-the-collar riffing of “Inhale” to the instantly infectious pop exultation of “Ladylike” (on which Thornley proves that his stringed prowess extends to the banjo as well), the quartet pulls off the rare trick of challenging the listener while paying close attention to the pleasure centers so much modern rock ignores. 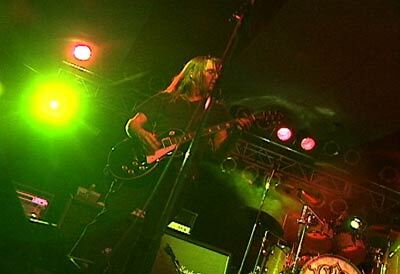 Featuring the rock radio favorites “That Song” and “The Oaf (My Luck Is Wasted)” – a top 10 Mainstream Rock smash – “IN LOVING MEMORY OF…” was also hailed by critics from coast to coast. The Boston Globe declared the album as “a melodic hard-rock gem,” while the New York Post raved that “Rock is back!” As the praise rolled in, Big Wreck pushed themselves even more relentlessly on the touring front, returning home only to pick up an “Outstanding Debut Band” honor at the prestigious Boston Music Awards. Those lessons are evident throughout “THE PLEASURE AND THE GREED,” which the band recorded with producer Dave Jerden, a veteran of sessions with bands as varied as Alice in Chains, Jane’s Addiction, and the Talking Heads. If Big Wreck’s debut – which largely expanded on their early demos – put fans on the ropes, this 16-song collection is sure to deliver the knockout blow. There’s no denying the pinpoint focus of tunes like the bone-rattling “Mistake” (which boasts some intense guitar interplay between Thornley and Brian Doherty) and the slow-burning album closer “Defined by What we Steal,” a heady gem propelled by the rhythms of Williams and bassist David Henning. The diversity that marks “THE PLEASURE AND THE GREED” can be traced to many things-a veritable encyclopedia of musical tastes, years of swapping influences and months of hunkering down, foxhole-style to record. But the stew of emotions and riffs that bubble beneath that surface spring directly from the well of primary songwriter Ian Thornley’s psychic slipstream.